It's about 500 miles from Nuku Hiva and the northern Marquesas to Ahe. before breaking into lovely clear weather on the approaches to the Tuamotus. We sailed through the pass at Ahe atoll against some 3 knots of current. No problem. we discovered that most of the villagers were in party mode for the French national day. and replaced by . . . a thriving black pearl farming industry! 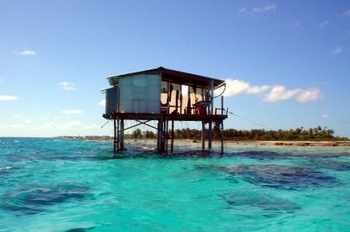 are now the economic backbone of the atolls of the Tuamotus Archipelago, having solidly displaced the copra industry which now languishes as a slimly surviving historic holdover. Chrissi traded an old CD and a few T-Shirts for this handful of pearls. a nice party in these friends' backyard. 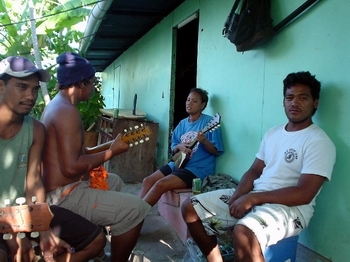 South Pacific music, and Poynesian music in particular, seems pretty "hokey" to us, with our backgrounds in Soca and Rock and Jazz. It's a kind of mix of redneck country and Hawaiian hula. It's heavy on the Ukelele and strong on voice harmonies. The passion of the singers for this kind of thing can be a bit surprising but it's delightful and engaging too. oysters are prepared and the pearls are carefully recovered. 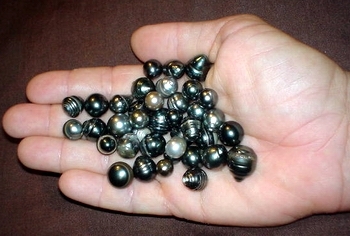 Precise extraction and judging of each pearl determines its future market and the price it will bring. 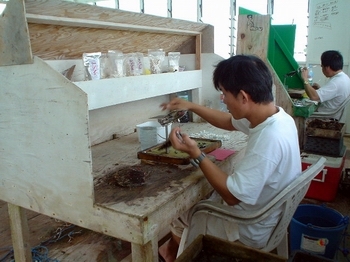 Chinese pearl experts seemed to dominate this part of the pearl farming process. 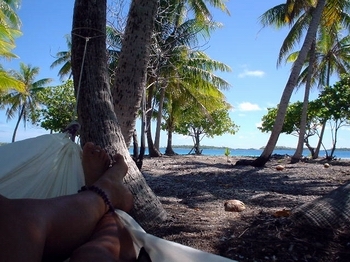 and to find a few moments to relax - as on this Ahe atoll adjacent to Tenukupara.